Isaac Mizrahi fragrance and perfume list. Isaac Mizrahi fragrances: by Xcel Brands. 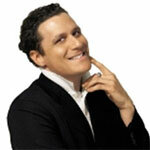 Isaac Mizrahi is an American fashion designer. He launched is first fragrance, Fabulous, with The Cloudbreak Group on Sept. 6, 2012. American fashion designer, Isaac Mizrahi was born 14 Oct 1961 in Brooklyn, New York to Egyptian Jewish parents. Isaac was gifted with his first sewing machine by his father at age 10. Later he attended the Parsons School for Design in New York City. His first collection was presented at NY's Bergdorf Goodman in 1987. In 2011, his fashion line was sold to Xcel Brands.